A few weeks ago, PBS ran a encore broadcast of “Hey Boo: Harper Lee and To Kill a Mockingbird.” The book needs no introduction, of course, being one of the essential novels taught from high school right through to university-level English and writing courses. 30 million copies have been sold in the book’s lifetime, and each year of its current life brings another quarter-million new volumes into reader hands. Were it not for a gifted editor at a 1950s publisher, the book may never have changed so many lives. Few of those millions of readers probably know the name Tay Hohoff, but without her work, Harper Lee might only be a retired airline reservations clerk or a schoolteacher of English in Alabama. Garrison Keillor wrote a 2006 review of a Charles’ Shields’ Harper Lee biography, and in the review titled Good Scout he noted how Shields tipped his cap to Hohoff. A year later, Lee has the beginnings of a novel, “Go Set a Watchman,” which becomes “Atticus,” which, under the tutelage of a patient editor at Lippincott named Tay Hohoff (“dressed in a business suit with her steel gray hair pulled tightly behind her, . . . short and rail-thin with an aristocratic profile and a voice raspy from cigarettes”), after a cold winter night breakdown, she finishes in the summer of 1959. An editor can make all the difference, but like the editors in cinema toiling over final cuts in dark rooms, these stewards of story don’t come out to take a bow very often. 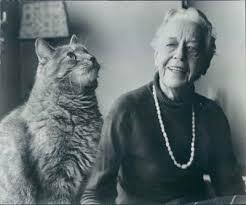 Hohoff wrote one book of her own, a 1971 salute to cats. Some of her best writing came in notes to authors like Lee. Hohoff’s best work was in the service of someone else’s story. From a Newsweek article about who created To Kill a Mockingbird came this version of the genesis. It also explains that cold night’s breakdown. “There were dangling threads of plot, there was a lack of unity—a beginning, a middle, an end that was inherent in the beginning,” said Tay Hohoff, an editor at J.B. Lippencott, who described the submission to Lee’s biographer, Charles Shields. Still, Hohoff and the others at Lippencott saw something promising in it and took a chance. Lee clearly needed guidance — but she would get it. Lee rewrote the novel three times over the next two and a half years. At one point, she threw the manuscript out the window and called Hohoff. Her editor persuaded her to go outside and gather the floating pages. There’s another editor in the wings of an even greater classic, Gone With the Wind. Lois Cole discovered the manuscript that Margaret Mitchell hurled at a “book scout” for the novel’s publisher. Revisions took three years on a novel that Mitchell drafted over the course of six years. The work of an editor was once the most essential part of lifting books into publication, but it’s a spotty experience by today. Novelists who have good editors rave over the collaboration rocket fuel that produces high fliers of books.